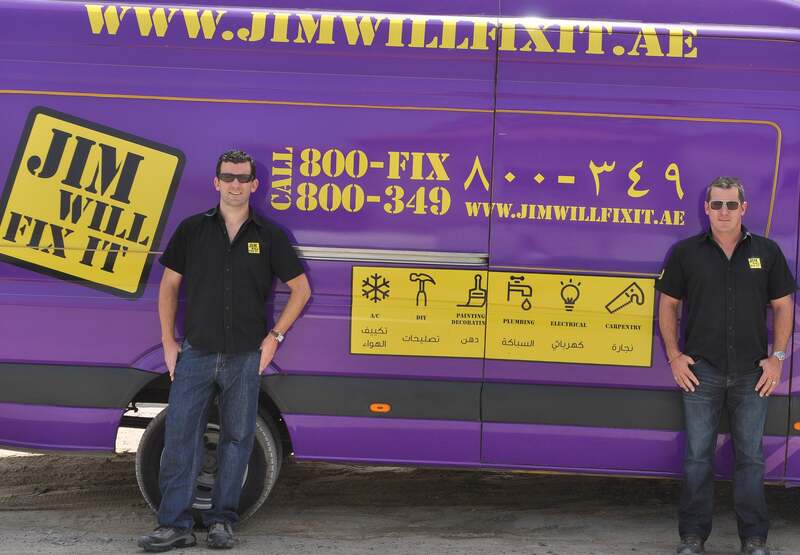 Launched in 2008, Jim Will Fix It came into being when the founders Daniel Garner and Colin Thomas found the lack of quality property maintenance in the UAE to be extremely frustrating. “Back then, you only had the choice of maintenance companies that would insist their customers sign an expensive annual maintenance contract,” Thomas says, adding that consumers has to choose either that, or make use of freelance technicians who spoke limited English. “We felt confident there had to be a better way of delivering a reliable maintenance service that customers could trust.” With Jim Will Fix It, customers can choose to have a one-time service, and so the company ensures excellence is delivered every time, so as to encourage customers to call back. And it’s a strategy that seems to be working: while Jim Will Fix It started out with just two vans on the road, it currently has more than 30 vehicles operating daily across Dubai. Having worked previously with the brand management team of Kraft Foods and Sony PlayStation, Thomas’ focus at Jim Will Fix It is on the management and development of his company’s brand. His technique to run the company efficiently? “Forecast effectively to match demand,” he replies. “This reduces the variables and ensures we remain profitable with positive cash flow.” Talking about the entrepreneurial ecosystem, the co-founders are fans of Souq.com, a startup started in 2005 that Thomas says embodies adapting to the needs of the market, and compliments its “establishment of excellent systems” and reliability of their delivery. In terms of resources for entrepreneurs in the UAE, Thomas asserts the need for access to effective market research and business banking assistance, as well as a clear and accurate guide to the processes and procedures to start a business in the country. Why do you feel there’s a need for Jim Will Fix It? While many people understandably bemoan quality issues, these environmental factors play a large role in the additional maintenance requirements of properties in the region. Before we arrived in the market, domestic maintenance companies only offered annual contracts often serviced by unqualified staff using poor quality tools and materials. There is a strong demand for our ‘one job at a time’ approach, and as we take no money upfront, we have to be good at what we do to ensure repeat customers. What are some interesting trends do you notice in your industry? Whilst the domestic maintenance industry appears to have low barriers to entry, the reality is that our industry is both low margin and capital intensive. In effect, it’s the worst scenario for a startup. Unfortunately for most of these new companies, this has been realized the hard way, as the market is very different now to when we entered it seven years ago. Indeed even with the knowledge that we have now gained, I doubt that we would be as successful if we were starting again now. We start by treating all of our staff with respect, as we cannot expect our staff to bring our brand values to life without this. It is important to us that we remain an employer of choice by ensuring we develop our staff as individuals within the existing framework of the company, instead of treating them just as labor, as is often the case in the region. We therefore offer ongoing training to develop their skill sets, clear and attainable career growth, and when new positions are created, we always look to promote from within the company before advertising externally. Don’t activate until your research is as solid as it can be- we spent six months in daily research to prove our business model would work. If you are underfunded, rework your idea (and not your sales projections) to sit comfortably within your budget with double the contingency you thought you needed. Employ an accountant from day one. This is advice we were given before we set up, and we ignored it as we thought our money was better spent elsewhere. As a result, we had more sleepless nights than were necessary and lacked a clear picture of our financial position. We soon rectified our mistake. To be more adaptable and to never feel defeated was a major lesson. When you start a business, time and finance are always some of the most pressing issues. Hence, making the decision to outsource or do something yourself (especially when it falls outside of your skillset) is a juggling act. Staying positive during the tough times is also a major benefit as obstacles get in the way. Dan [Garner] and I were both so committed to Jim Will Fix It that we were prepared to make it work at all costs. We had to dig so much deeper than we expected to achieve, but it is amazing how often we hear similar stories from other startups.